This next installment in the series is the final episode that I had made before deciding to revamp my approach to completing Chico Bandito earlier this month. Which is to say, that all the episodes that come after this one will all be first time debuts. 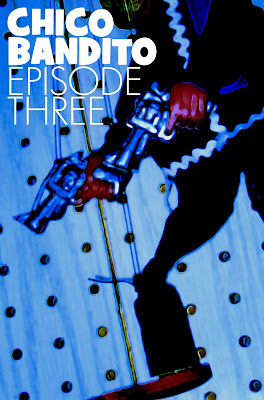 Episode 3 was originally uploaded on September 28, 2008 and helps to clarify how despite his ability to get down, Chico Bandito continues to end up hanging on the wall. In the first episode it's easily assumed that Chico is walking out of the laundry room which helps tie into the outdoor start in episode 2. What episode 3 helps to establish is that Chico is constantly dreaming of his outdoor escape, but is significantly limited in his means of escape. This results in his first actual scheme at getting out, as well as further revelations between Chico's dream and the real world. One of my core guidelines in creating the series was that no episode was to be longer than 3 minutes. Episode 3 is only 2 minutes and 21 seconds long, so stick around! The next chapter of Chico Bandito starts now!